When summer has come to an end and it’s time to take your summer baskets down you don’t have to leave empty spaces - take a look at our Autumn hanging baskets. For these we use a mixture of plants that will tolerate the cooler weather, although the mainstay will be viola and pansy varieties which will continue producing an abundance of flowers through the autumn and into winter. 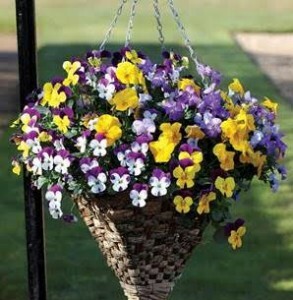 As with our summer hanging baskets, we like to fill and hang our baskets for approx 2 weeks before they are suitable for hanging outside and we would be pleased to make baskets up for you. Orders are welcome in any quantity, combination or colour. We use top quality compost with a slow release feed in our autumn hanging baskets. Care should be taken not to overwater during the winter months and try to deadhead faded flowers to encourage more blooms to be produced and prevent them from setting seed.